Will We Demand the Inexpensive Fix Which Will Prevent Armageddon … Or Stay Distracted By Over-Blown Dangers and Ignore The Thing Most Likely To Actually Get Us? Well-known physicist Michio Kaku and other members of the American Physical Society asked Congress to appropriate $100 million to harden the country’s electrical grid against solar flares. As shown below, such an event is actually the most likely Armageddon-type event faced by humanity. Kaku explains that a solar flare like the one that hit the U.S. in 1859 would – in the current era of nuclear power and electric refrigeration – cause widespread destruction and chaos. Not only could such a flare bring on hundreds of Fukushima-type accidents, but it could well cause food riots globally. Kaku explains that relief came in for people hit by disasters like Katrina or Sandy from the “outside”. But a large solar flare could knock out a lot of the power nationwide. So – as people’s food spoils due to lack of refrigeration – emergency workers from other areas would be too preoccupied with their own local crisis to help. There would, in short, be no “cavalry” to the rescue in much of the country. In fact, NASA scientists are predicting that a solar storm will knock out most of the electrical power grid in many countries worldwide, perhaps for months. See this, this, this, this, this, this and this. A 2009 study by the National Academy of Sciences warned that a massive geomagnetic assault on satellites and interconnected power grids could result in a blackout from which the nation may need four to 10 years to recover. In May 2012, a US Geological Survey report estimated a 6 percent chance of another Carrington event [referring to the solar flare of 1859 which was so strong that telegraph lines, towers and stations caught on fire at a number of locations around the world, and sparks showered from telegraph machines] occurring in the next decade. But we do not know whether or not the Carrington event was as bad as sunstorms get. [University of Kansas physicist Adrian ] Melott proposed that material from a solar megaflare 10 times the strength of the Carrington kind bombarded this planet around the year 775. Earth barely missed the “perfect solar storm” that could have smashed into our magnetic field and wreaked havoc with our satellite systems, electronics and power systems, potentially causing trillions of dollars in damage, according to data from NASA’s STEREO-A spacecraft. “Observations of such a solar superstorm during a very weak solar cycle indicate that extreme events are not as infrequent as we imagine,” the authors wrote. We have the very real possibility that a geomagnetic storms of an intensity that has happened before–and will happen again–could knock out the power to tens of millions of Americans for multiple years. The electrical grids in Europe and northern Asia have similar vulnerabilities, so a huge, years-long global emergency affecting hundreds of millions of people and costing many trillions of dollars might result from a repeat of the 1859 or 1921 geomagnetic storms. Figure 2. Computer model study showing electrical systems that might be affected by a geomagnetic storm equivalent to the May 14-15, 1921 event. The regions outlined by the heavy black lines are susceptible to system collapse lasting months or years. A population in excess of 130 million might be affected, at a cost of $1-2 trillion in the first year after the event. The network of thin black lines shows the location of the nearly 80,000 miles long-distance heavy-hauling 345kV, 500kV and 765kV transmission lines in the U.S.–the main arteries of the U.S. electrical grid. The circles indicate magnitudes of geomagnetically-induced current (GIC) flow at each transformer in the network, and the color of the circle indicates the polarity of the current. Image credit: John Kappenman, Metatech Corp., The Future: Solutions or Vulnerabilities?, presentation to the space weather workshop, May 23, 2008. What would happen to nuclear power plants world wide if their power – and most of the surrounding modern infrastructure – is knocked out? Nuclear power companies are notoriously cheap in trying to cut costs. If they are failing to harden their electrical components to protect against the predicted solar storm, they are asking for trouble … perhaps on a scale that dwarfs Fukushima. Because while Fukushima is the first nuclear accident to involve multiple reactors within the same complex, a large solar storm could cause accidents at multiple complexes in numerous countries. A large solar storm which knocks out electrical grids over wide portions of the planet will happen at some point in the future. Don’t pretend it is unforeseeable. The nuclear power industry is on notice that it must spend the relatively small amounts of money necessary to prevent a widespread meltdown from the loss of power due to a solar storm. As scientists warn of an impending solar storm … that could collapse the national power grid, thrusting millions into darkness instantly, a debate has flared up between utilities and the federal government on the severity of such an event. They say it could have the effect of frying electronics and knocking out transformers in the national electric grid system. Already, there are separate published reports of massive solar storms of plasma – some as large as the Earth itself – flaring off of the sun’s surface and shooting out into space, with some recently having come close enough to Earth to affect worldwide communications and alter the flights of commercial aircraft near the North Pole. But in February, the North American Electric Reliability Corporation, which represents the power industry, issued a stunning report asserting that a worst-case geomagnetic “super storm” like the 1859 Carrington Event likely wouldn’t damage most power grid transformers. Instead, it would cause voltage instability and possibly result in blackouts lasting only a few hours or days, but not months and years. NERC’s assertion, however, is at serious variance with the 2008 congressional EMP Commission, the 2008 National Academy of Sciences report; a 2010 Federal Energy Regulatory Commission report; the 2012 report by the Defense Committee of the British Parliament, and others. Even the British scientists who contributed to the parliament report came to their own independent assessment that a great geomagnetic storm would cause widespread damage to power grid transformers and result in a protracted blackout lasting months, or even years, with catastrophic consequences for society. [The U.S. Federal Energy Regulatory Commission or “FERC”], which regulates interstate electricity and other energy sales but has no authority now over local utilities to harden their grid sites, says that as many as 130 million Americans could have problems for years. U.S. transformers on the average are more than 30 years old and are susceptible to internal heating, according to FERC experts. There is ample evidence in the possession of the FERC revealing the damage to transformers from previous geomagnetic storms. For example, there was serious transformer damage to the Salem nuclear power plant in New Jersey in the aftermath of the same geomagnetic storm that caused the March 1989 Hydro-Quebec blackout. In addition, we’ve spent tens of trillions on the “war on terror”, but have failed to take steps to protect against the largest terrorist threat of all: an attack on the power supplies to nuclear power plants. An electromagnetic pulse (EMP) which took out the power supply to a nuclear power plant would cause a Fukushima-style meltdown, and spent fuel pools are extremely vulnerable to terrorism. Indeed, failing to harden our electrical grid invites a terrorist EMP attack because it is such an obvious vulnerability … its like waiving a red flag in front of a bull. Given that the Department of Homeland Security concludes that even North Korea can launch an EMP attack on the U.S., this is a real vulnerability. Unless we harden our electrical system to withstand electrical pulses, an EMP remains an attractive method for bad guys to bring the U.S. to its knees. Bottom line: Failing to harden our grid invites catastrophe from solar flares and terrorists. It makes us doubly vulnerable. There’s An Easy Fix … Are We Smart Enough to Take It? Japan’s nuclear meltdown, the economic crisis and the Gulf oil spill all happened for the same reason: big companies cutting every corner in the book – and hiding the existence of huge risks – in order to make a little money. 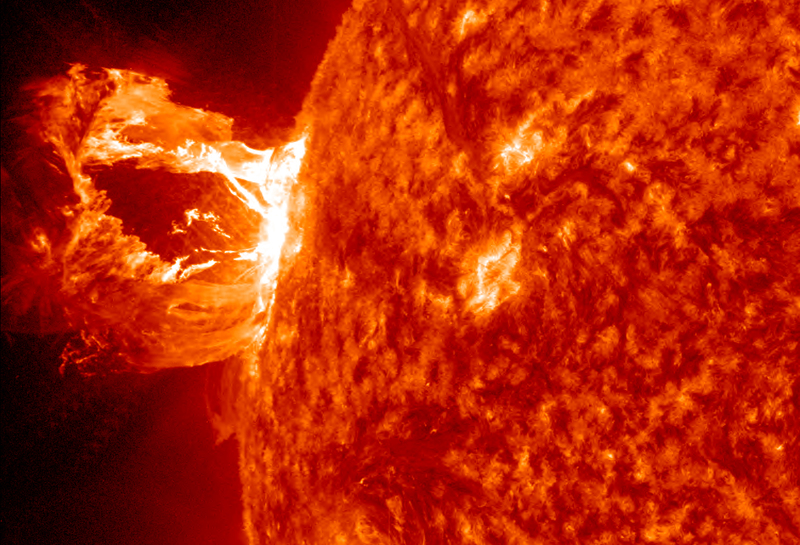 There are relatively easy fixes to the threat from solar flares. We think it’s do-able for $40,000 or less per resistor. That’s less than what you pay for insurance for a transformer. If you’re talking about the United States, there are about 5,000 transformers to consider this for. The Electromagnetic Pulse Commission recommended it in a report they sent to Congress last year. We’re talking about $150 million or so. It’s pretty small in the grand scheme of things. The good news is that relatively affordable equipment and processes could be installed to protect critical components in the electric power grid and its nuclear reactors, thereby averting this “end-of-the-world-as-we-know-it” scenario. The bad news is that even though panels of scientists and engineers have studied the problem, and the bipartisan Congressional electromagnetic pulse (EMP) commission has presented a list of specific recommendations to Congress, our leaders have yet to approve and implement any significant preventative measures. To do nothing is to behave like ostriches with our heads in the sand, blindly believing that “everything will be okay” as our world drifts towards the next natural, inevitable super solar storm and resultant extreme GMD. Such a storm would end the industrialized world as we know it, creating almost incalculable suffering, death and environmental destruction on a scale not seen since the extinction of the dinosaurs some 65 million years ago. The federal government recently sponsored a detailed scientific study to better understand how much critical components of our national electrical power grid might be affected by either a naturally occurring GMD or a man-made EMP. Under the auspices of the EMP Commission and the Federal Emergency Management Agency (FEMA), and reviewed in depth by the Oak Ridge National Laboratory and the National Academy of Sciences, Metatech Corporation undertook extensive modeling and analysis of the potential effects of extreme geomagnetic storms on the US electrical power grid. Based upon a storm as intense as the 1921 storm, Metatech estimated that within the United States, induced voltage and current spikes, combined with harmonic anomalies, would severely damage or destroy over 350 EHV power transformers critical to the functioning of the US grid and possibly impact well over 2000 EHV transformers worldwide. EHV transformers are made to order and custom-designed for each installation, each weighing as much as 300 tons and costing well over $1 million. Given that there is currently a three-year waiting list for a single EHV transformer (due to recent demand from China and India, lead times grew from one to three years), and that the total global manufacturing capacity is roughly 100 EHV transformers per year when the world’s manufacturing centers are functioning properly, you can begin to grasp the implications of widespread transformer losses. The loss of thousands of EHV transformers worldwide would cause a catastrophic grid collapse across much of the industrialized world. It will take years, at best, for the industrialized world to put itself back together after such an event, especially considering the fact that most of the manufacturing centers that make this equipment will also be grappling with widespread grid failure. The Congressionally mandated EMP Commission has studied the threat of both EMP [i.e. an electromagnetic pulse set of by terrorists or adversaries in war] and extreme GMD events and made recommendations to the US Congress to implement protective devices and procedures to ensure the survival of the grid and other critical infrastructures in either event. John Kappenman, author of the Metatech study, estimates that it would cost about $1 billion to build special protective devices into the US grid to protect its EHV transformers from EMP or extreme GMD damage and to build stores of critical replacement parts should some of these items be damaged or destroyed. Kappenman estimates that it would cost significantly less than $1 billion to store at least a year’s worth of diesel fuel for backup generators at each US nuclear facility and to store sets of critical spare parts, such as backup generators, inside EMP-hardened steel containers to be available for quick change-out in the event that any of these items were damaged by an EMP or GMD. For the cost of a single B-2 bomber or a tiny fraction of the Troubled Asset Relief Program (TARP) bank bailout, we could invest in preventative measures to avert what might well become the end of life as we know it. There is no way to protect against all possible effects from an extreme GMD or an EMP attack, but we could implement measures to protect against the worst effects. Since 2008, Congress has narrowly failed to pass legislation that would implement at least some of the EMP Commission’s recommendations. Citizens can do their part to push for legislation to move toward this goal and work inside our homes and communities to develop local resilience and self reliance, so that in the event of a long-term grid-down scenario, we might make the most of a bad situation. The same tools that are espoused by the Transition movement for developing local self-reliance and resilience to help cope with the twin effects of climate change and peak oil could also serve communities well in the event of an EMP attack or extreme GMD. If our country were to implement safeguards to protect our grid and nuclear power plants from EMP, it would also eliminate the primary incentive for a terrorist to launch an EMP attack. The sooner we take these actions, the less chance that an EMP attack will occur. Will we insist that these inexpensive fixes to our electrical grid be made? Or will we focus on over-blown dangers … and ignore the thing most likely to actually get us?